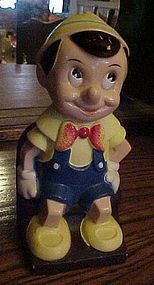 Vintage Disney Pinocchio bank by Play Pal Plastics Inc.
VTG WALT DISNEY PINOCCHIO COIN BANK PLAY PAL PLASTICS. Measures 8" tall, 3 5/8" wide and 2 7/8" deep, ©1970s. Slight wear on hair and edges,see photo. Original stopper intact.